The special time you’ve been waiting for has at last arrived, boys and girls. It’s PARCC testing week! Think Easter but with a few key differences. Like instead of hunting for eggs, you’re after *college and career readiness. 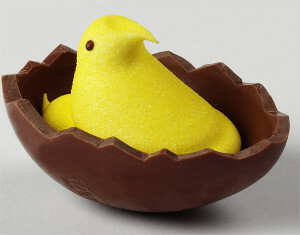 * Also, those Peeps in your basket aren’t for realz but are being *piloted* to help determine what should go in your basket next year. Which is to say that it’s never a good idea to put all of the kids’ eggs in one basket, even if the state’s chief educational standards bunny happens to serve as the chair of an egg distributor. Well now that PARCC is in full swing at our schools……stress levels are at an all time high. Where is the research that supports that PARCC is a better assessment tool to measure achievement? Teachers in this district have had everything but the kitchen sink thrown at them with no guidance or help. We are expected to test children over the next 3 WEEKS in 5 sessions of ELA and Math combined. MCAS was 2 sessions of ELA and 2 sessions of Math and they were not given at the same time. We not only have ELA and Math done at the same time but we have to test AGAIN in May both ELA and Math. Not only that, we have to take the EOY benchmark tests that the district thinks shows how well we teach!!! LMAO!! Where is the teaching? We are spending way too much time taking tests that we dont even have time to look at what information these tests could give us. Teachers and students are stressed out and are beginning to shut down. Let's not even get into the schools who have no coverage for these tests because there has to be two adults in the room. How do you do that with only one para? Hmmmmmmm? I have been teaching for a very long time and this is the first year I feel very ineffective. I have students in my class who don't speak English who still have to take the test…..ridiculous. One accommodation on the PARCC test that is allowed is the human read aloud. Not only for the questions (MCAS only allowed directions and questions) but for the passage itself. I thought part of the idea of the test was to test their comprehension of what is read? I guess that went out the window. Now to top off all of this, some parents are opting for their child not take the test and its up to the TEACHER to place the test in front of the CHILD and have them decide whether or not to take it!!! Their parent has already signed an opt out form so why put the child through that? Again, it gets put back on the teacher to put that child through that. All because the lovely school committee voted to take part in this ridiculous test. Do any of the school committee members even know what is on the test, did you have an idea of how long the test was, or even how many times a year the children tested????? Parents wake up and start fighting for your child's education!!!!! Good Luck getting everyone or anyone to stand to fight for or against anything. For months this blog has been virtually silent, with either No Comment or just a few comments on post after post. What a change from last year when this blog was on fire with posts and comments.Where has everyone gone? Is it that everyone now is content or has everyone just given up the fight?